All moms are working moms but somehow that description is used for mothers working outside of the home. These are mothers who are working what has been called “double shifts” because they have a work shift at a job and another work shift at home. Attention has been given to the fact that fathers are now fuller participants at home than in the past but many mothers – if not most – feel that they are still the parent on call, such as when a child gets sick at school or has to remain home. In the last cartoon, the “good” mother is clearly pretending to listen as she takes her child off to daycare. The implication of the whole strip seems to be that the way to solve the balance problem is to give a good imitation of doing what you think a “good” mother would do. My reaction to the strip was to wonder why a mother would think that listening to a three-hour story is what a “good” mother should do. The question of how to balance work at a job and parenting remains an unresolved issue despite all the gains women have made in numerous areas. In the cartoon cited it is not clear what the significance is of the mother taking her child to daycare. Since the first mother is concluding that the secret is “faking it,” does that mean that you are not really a “good” mother if your child goes to daycare? In fact, affordable quality daycare is one thing that would go a long way in improving life for many children and for families generally. The conflict is not simply between having or wanting to work at a job and being a full-time mother. Every day, decisions have to be made about what one perceives to be the needs of one’s child versus the demand of one’s job. These decisions are made based on who we are and the parenting philosophy or approach that we follow. One’s personal history plays a large role in such choices. All the approaches to child-rearing have a point of view regarding the needs of children, the importance of these needs, and the nature of response that is required from parents. In the questions that are faced daily in interactions with children the choices made depend not only on what you know about your own child, but also on how strongly you feel about the importance of certain kinds of responses. Can you accept and tolerate a measure of frustration or unhappiness in your child? And even if you can how do you determine what is an acceptable amount and what is not? There are no “right” answers to such questions, which is why balancing needs consists of an ongoing set of questions which parents have to answer in terms of themselves and their own children. Out now in paperback: "Goodenoughmothering: the Best of the Blog". Great gift for your favorite parent. 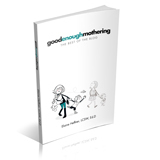 Good Enough Mothering Blog at WordPress.com.